Democrat Glenda Ritz, a media specialist in Washington Township, is running against incumbent Tony Bennett for Superintendent of Public Instruction. Democrat Glenda Ritz launched her campaign for Superintendent of Public Instruction Thursday, with the backing of gubernatorial candidate John Gregg. Justin Oakley dropped out of the Democratic race shortly after the Indiana State Teachers Association endorsed Ritz. 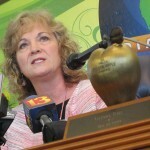 Ritz, who teaches at Crooked Creek Elementary School in Washington Township, has criticized incumbent Tony Bennett for pushing the educational priorities of Mitch Daniels’ administration. She said Thursday Bennett has been wrong to focus on high stakes testing. Will Tony Bennett Be ‘Raked Over Coals’ In The Statehouse Chambers? Ritz is against the expansion of school vouchers — she’s a plaintiff in an ongoing suit that challenges Indiana’s law — but says she felt compelled to run after the legislature approved a reading test that allows districts to retain third graders who don’t pass. 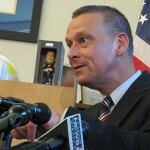 Bennett touted an 85 percent pass rate when he announced he would run for a second term. Ritz faces an uphill fundraising battle against Bennett, for whom contributions began rolling in from out of state even before he announced his candidacy. The Fort Wayne Journal Gazette‘s Karen Francisco has been tracking large contributions to Bennett’s re-election campaign on her Learning Curve blog, including $25,000 from Merrillville businessman Dean V. White, $25,000 from New York school choice supporter Roger Hertog and $10,000 from William Oberndorf, who is connected to Bennett through former Florida governor Jeb Bush. In total, Bennett has more than a half million dollars in the bank. Ritz, who just filed with the Secretary of State in late May, has received one large contribution — $30,000 from IPACE, the political action committee of the ISTA. 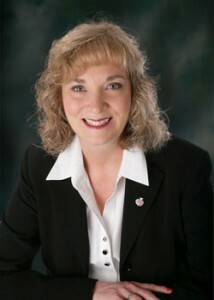 Though Ritz is running as a Democrat, Indy Politics reports she cast a Republican ballot in the 2012 primary election and in most primaries from 1990 to 2006. Democratic leaders, meanwhile, are trying to get Ritz’s only challenger for the nomination, Fort Wayne resident Melissa Ann Hicks, disqualified for filing to run in a city race as a Republican.